This is a little house made of cardboard boxes. I made it 4 years ago as a Christmas gift for my little one and I’m always surprised at how well it’s holding up and how long it’s been kicking around. My main construction material: a couple of large cardboard boxes of course. And I recall using LOADS of my husband’s good carpenter’s glue as an adhesive. I worked in steps over the course of a week, taking my time with all the measurements. Whenever I glued on pieces, I clamped them together with painter’s masking tape – you know the kind that’s not too sticky – to let the glue set and then removed the “clamps” once the glue was dry. I used old house paint with an eggshell finish to paint the thing so I can actually wash the walls which is pretty neat. And yes, I’ve actually washed the walls. I used a thrifted piece of aqua-coloured vinyl for the floor. The leftover pieces of vinyl I cut into curlicues and glued to the walls for a decorative touch. 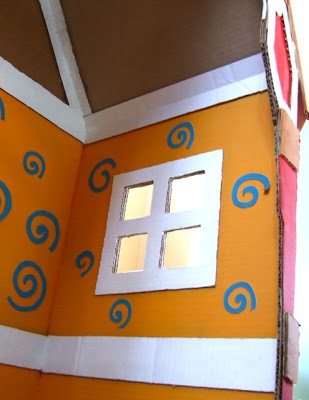 I used craft paper (you know the brown stuff used for covering packages), rolled it up into thin rolls and then flattened out the rolls to make a thin moulding for the outer edge of the roof peak. The boy doesn’t play in it anymore but it still resides in his room. He now uses it as a lovely place to store his beloved stuffed animals. 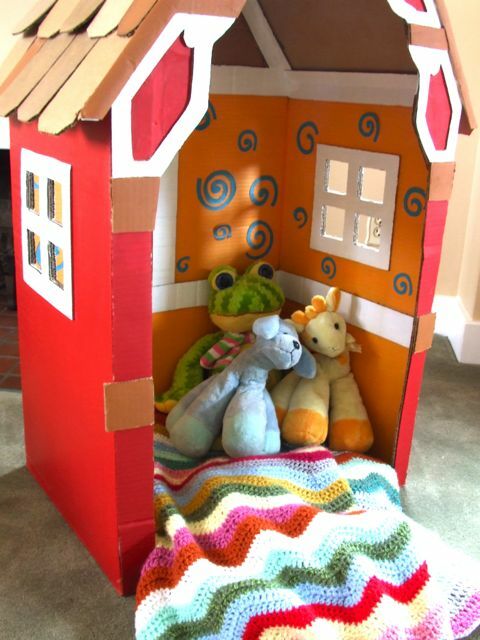 I think the animals are happy in their colourful little home. It’s a nice place they’ve got there! P.S. Here is a link with plans for an alternative cardboard house at Make Baby Stuff. Love the little house with the babies inside!!! Oh my, this is awesome!!! How cool that you made that! Oh! I'm so glad you shared this with us finally. It's one of my favorite things that you have made. I can't believe that it has survived so well! That's amazing! I have never made one that was reinforced though. It's fabulous! 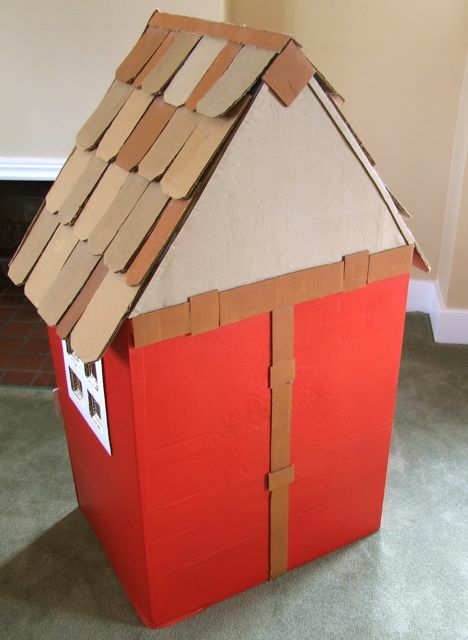 My kids love cardboard box creations. Holy, you make the coolest stuff! That is an amazing house. 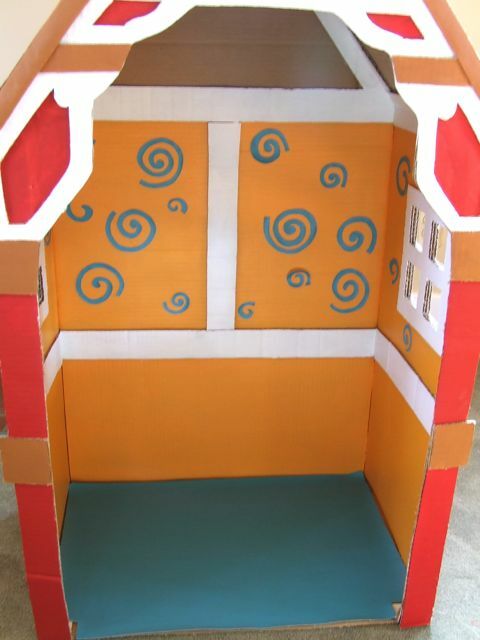 My kids were lucky if I could carve out a door and a window from a cardboard box. Comme toujours , une superbe création !!!!! What amazing detail you put into this cute little house! Puts my effort to shame whichb was to cut 2 windows and a door into a large box that our new washing machine came in when my eldest was 3 years. She loved it though especially as I let her draw all over it. Very creative and kudos for putting enough time and effort into it – made to last! Very cute! I love that it is still around. 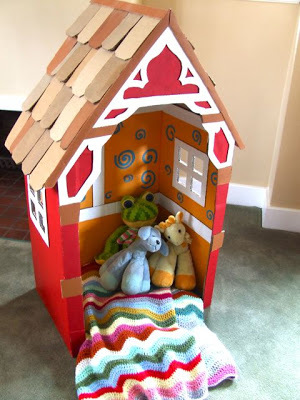 here's another place to link up this little beauty on our blog's linky party! I love this. And how timely: perfect for rainy days … and snowy days… to play in this! Holy Buckets – that is absolutely out of this world. I am glad you shared all the details of how you made it that made it sturdier. I remember the best present ever was a basement full of boxes. We played with them for months. If you want come on over and link this up to my reuse challange linky party it will even get you an extra entry to the giveaway tomorrow. Seriously…this has to be the cutest thing I have seen all day. I want one!! Wow! You are creative!! I never would have thought that was made of cardboard!!! It's so nicely made and pretty! I would love plans for this if you ever have them available…my munchkins would love it. UNBELIEVABLE!! I can hardly believe that came from a cardboard box. WOW. OH WOW. 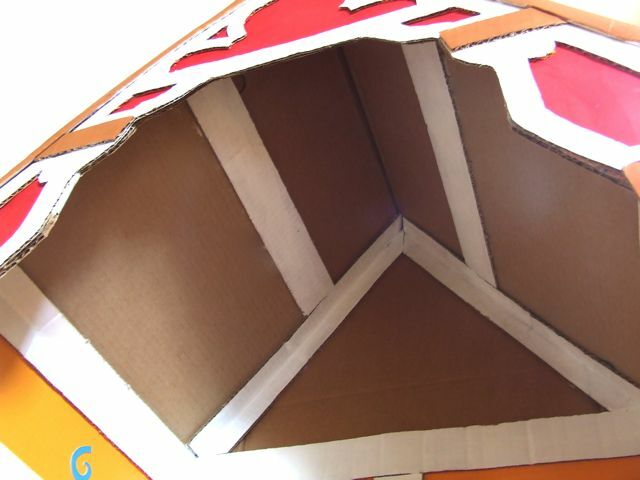 We used to make forts out of boxes but they sure as heck never came out anywhere near as impressive as this. I need to try making one on a small scale for my cat. She will love it! That is so cute! I can't believe it has held up so well, amazing! Beautiful house! I like the idea that he stills uses it to store toys in his room too. popping by from m.m.m on C.R.A.F.T. so sweet! 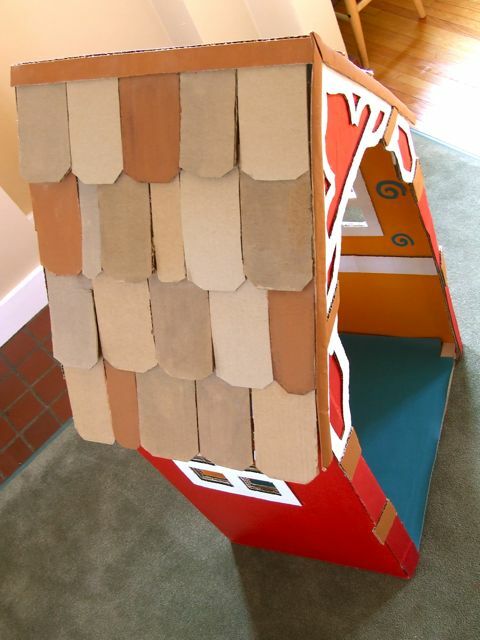 I'm also amazed how well it has fared over time…I guess your little one didn't try climbing on the roof much! thanks so much for sharing on Craft Schooling Sunday! This is just adorable! What little kid wouldn't love to "live" there! That is adorable! 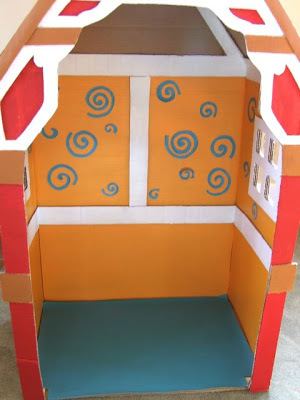 Several years ago my sons and I made a cardboard barbie house for my daughter and we used similiar methods in reinforcing it and it is still holding up great too though it has been well played with. Cardboard really works well. Hey! How did I miss this? Just found it via Peaches. This is too amazing, it has all your delicate touches of sweetness. What a lovely creation! 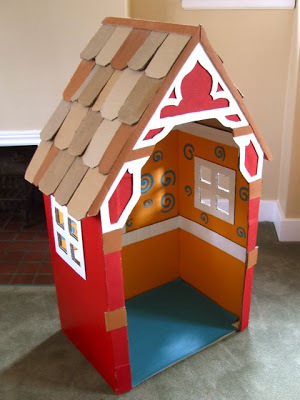 I am very interested in a printable plan for the little house! My grandaughter will be coming for a visit from Germany soon, and I know she will absolutely love this. What brand are the cute stuffed animals in your house? We've since donated these little guys so I have no idea what brand they are. Sorry about that Becky!